Fans of Alex Kingston’s River Song have something else to look forward to as the next season of Doctor Who approaches. The Doctor’s wife will meet the 12th incarnation of her husband for the first time during this year’s Doctor Who Christmas Special. According to the Telegraph, Kingston arrived in Cardiff this week to begin filming the Christmas episode, which has become a tradition since the program was revived a decade ago. 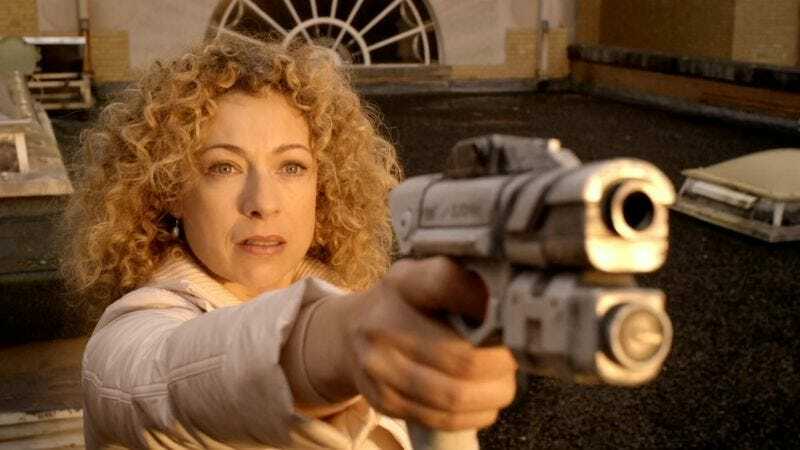 For those not fully steeped in her storyline, River Song is a fellow time traveler, who, due to her movement through time, experienced her relationship as temporally inverse to her husband. Essentially the first time the 10th Doctor (David Tennant) meets River Song, it also the last time she meets him, and vice-versa. That wouldn’t really account for a subsequent meeting with Peter Capaldi, but no doubt there will be some sort of quasi-logical, timey-wimey explanation that we’ll all just go along with, because it’s Doctor Who. Seeing as how Dr. Song was always rather smitten with her Gallifreyan husband (and also with teasing him, usually in his Matt Smith-11th incarnation), and that she tends to scoff at authority figures, there will likely be some turbulence between Song and Capaldi’s crustier and manically cranky 12th doctor. Expect sparks of some type to fly, even if they’re just from the TARDIS’ control panel, when Doctor Who returns for a ninth season on September 19.